The members two North American press trips that visited the destination took back ample information from their tour, during which they happened to bump into Kourtney Kardashian, marveled at the Islas Marietas and enjoyed the SUP & Paddleboard World Championship. The work of the Public Relations department of the Riviera Nayarit Convention and Visitors Office has reaped quite a few benefits thanks to international press FAM trips, the StandUp Paddle & Paddleboard World Championship, celebrity visits to the destination and the many attractions it holds. During the first two weeks of the month the destination hosted a Romance FAM trip for Canadian and US press and the North American Travel Journalist Association’s (NATJA) Riviera Nayarit Post Tour; Kourtney Kardashian and her husband were spotted here, as was Charlotte Ross. The Romance FAM trip was hosted in collaboration with Iberostar Playa Mita. There were two groups of five journalists each, one from the US and the other from Canada. The invitees all represented media with immense reach, including About.com and Travel Age West, as well as specialized media such as Destination Weddings & Honeymoons. This FAM visited Nuevo Vallarta, Sayulita and the Islas Marietas, with a special emphasis on the Playa del Amor. 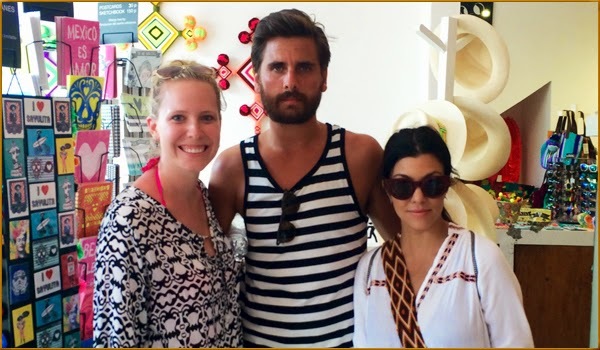 In a fun coincidence they ran into Kourtney Kardashian and her husband during their tour of Sayulita; journalist Taylor Elizabeth, from Destination I Do, took a picture with them and will surely be publishing about her visit. In other celebrity news, US TV and movie actor Charlotte Ross was spotted at Villa La Estancia during this same time period. The NATJA Post Tour in the Riviera Nayarit included a group of 18 journalists from the association who visited after their activities in Puerto Vallarta. Upon their arrival in Nuevo Vallarta their first site inspection was at the newly renovated Marival Resort. They hopped on bikes and followed the bicycle path through Nuevo Vallarta and Flamingos. Afterwards they went to Bucerías to tour this very Mexican village followed by the must-see tour of the Islas Marietas, where they saw dolphins and giant manta rays in their habitat and enjoyed a bit of SUP. Their trip went on to include El Anclote in Punta Mita and, finally, Sayulita, where they were able to witness the activity surrounding the ISA SUP & Paddleboard World Championship, as did the members of the Romance FAM trip.